Deuce is the potential of two singles joined together. While one is strongly individual, determined and centered, the task of numerologicznejing two is to reconcile these individualities in themselves. That is why this vibration is particularly predisposed to linking, communication between potentials. By this, the deuce is a strong value, merging with each other two opposite poles, aiming to center, balance, harmony. The spiritual world of a person born under the vibration of two is full of unspeaks, exploration, opposites and doubts. This is a compromise path of cognition which aims To deal with unity. When this point is reached, it manifests itself with calmness, gentleness and delicacy. Therefore, the man living in this vibration is a born diplomat, peacemaker. It often acts as a back-end person, creating its delicate nature of neutral substrates for the quality of opposites. Prudent, restrained, not imposing, is an excellent partner and friend. The silence of the mind that often represents this vibration seems little active, even passive. However, it is only the ground, created for better knowledge and understanding of all aspects affecting the matter. Thanks to this, a person born in Numerologicznej two, is very tolerant and extremely empatyczna. The desire to connect distant values, to find a compromise, mobilizes the two to understand and learn about both sides of the matter. In this way, it gives a field to the expression of the situation. Such a person is perfectly in the role of mediator, following freely and very flexibly in the development of the situation, wczuwając in it completely. The problem can be for two of the boundaries of personality, and with it to develop a posture assertive. This is important, because in the nature of the two lies the help and support of circumstances or other human beings. It needs protection against the use of its natural goodness and its willingness to help the stronger and less humane. The man Numerologicznej Deuces is incredibly sensitive and friendly. It is a great idealist, which places great demands on supporting in every possible aspect. Tirelessly, he balances between problems and opportunities, willing to advise those in need. More often, however, she engages her efforts in a considerate, almost imperceptible manner, because it bears in itself modesty, far from exalting itself. Building peace and a better life, a friendly and happy place for people is the fulfillment of this vibration numerologicznej. Working in groups, teaches other collaborations, dialogue, and reigns over their emotions. 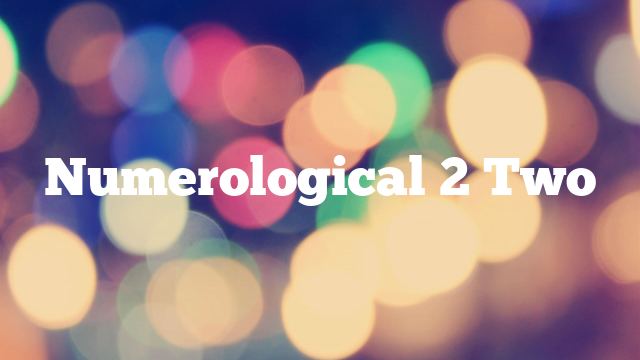 Numerologiczna 2 naturally feels that happiness and good relationships are built with love. This vibration, needs people and their matters, dilemmas. Want to be needed. At the same time, he needs places, reminding her and learning about the laws of nature, which are batteries for her quiet energy. Therefore, it is eager to observe the animals, delve into the world of wild nature and listen to the singing of birds. It is deeply reflective and is pleased to reasoning. There is a constant yearning for a connection to the rhythm and order of the world. A man born in the vibration of Numerologicznej deuces is often a lover of romantic disposition. The smoothness of the music, awakens in it the call of nature, ennobles and stimulates the affirmation of life. The innate sensibility makes the decision, driven by feelings and always respecting the order of nature. Therefore, it is a very obligatory vibration, but it is guided by its inner sense of goodness, which he wants to convey to the world. People from the environment where Numerologiczna two are living, want to believe in the world of ideals that nurtures this vibration. Therefore, despite the meekness, he convinces himself and his righteous reasons, arousing gratitude and a sense of well-done work, a good decision taken. Numerologiczna Two is the vibration of the naturalness. It is very easy to adapt to the environment, avoiding conflicts. As a barometer of human feelings with highly developed empathy and psychological wisdom, it is very hard to experience difficult relationships, kłótliwe sentiment, destructive emotions and the circumstances of destructive love. Under the influence of such circumstances, it becomes particularly attuned and unhappy, but it is extremely difficult to leave the ill-influenced environment.